It doesn’t take an industry veteran to know that going to the dentist just isn’t everyone’s idea of a good time. The anxiety and fear created at the simple thought of making an appointment causes many people to go years without seeing a dentist, resulting in the decline of their oral health. This stigma is a hard beast to conquer, and is often thought of as a marketing game—more friendly smiling stock photos on billboards means more foot traffic, obviously! While marketing certainly has its place in the industry, this stigma is best combatted by history’s biggest mover and shaker: technological innovation. When the Wright brothers took their first courageous leap onto their strange flying contraption, they challenged all preconceived notions of how mankind understood travel. They’re heralded as two of the greatest pioneers of the previous century, and their first powered flight in 1903 inspired humanity to put a man on the moon decades later. How is it that in the thousands of years of modern civilization, we were unable to accomplish a feat that two brothers and a spark of ingenuity were able to do, and then just 66 years later, push a human being beyond what anyone had ever considered possible? Both breakthroughs came about because of human ingenuity and technological innovation. We’re in an exciting time within the dental industry, and with innovations in technologies coming out almost daily we’ve found innovative ways to reach new patients, connect with existing ones and offer solutions that were inconceivable even a decade ago. I purchased my practice in December 2012, and from the beginning I knew that technology would play a vital role in the growth of my business. 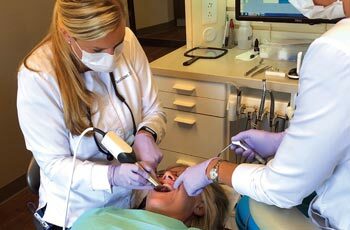 Having a few years under my belt and being a lifelong patient myself, I understood the way that walking into a modern practice with innovative technologies helped shatter the preconceived notions of a Renaissance-era dentist making house calls with hand cranks and pliers. This meant less-anxious patients, which resulted in more return visits and more compreheDr. Sarah Palmernsive treatment plans—and, ultimately, higher return on investment. With advancements coming ever more rapidly, it’s imperative to be able to sift through the sales pitches and trade shows and find the devices that will directly affect your bottom line. Here are a few of the key technology solutions that I believe have put my practice at the forefront of our industry. Some of these technologies could be the difference between a brief flight at Kitty Hawk and one giant leap for mankind. Using intraoral cameras, cavity-detecting devices and digital radiographs greatly aids in diagnosing. A more effective diagnosis directly results in a more comprehensive treatment plan. A diagnosis is only effective if the patient is knowledgeable about its implications; for this reason, our office has moved away from tedious informational packets and instead uses a combination of informational visuals through the screens in our waiting room, as well as reinforcement through conversations in our operatories. When patients start to understand the state of their oral cavity, they begin to feel like they’re also the expert—ultimately making case acceptance as easy as a simple agreement. In February 2016, I purchased the Cerec Omnicam scanner and MC X milling unit and the Programat CS2 porcelain furnace. I did so knowing that I needed a way to decrease turnaround time for restorations without compromising on quality. With this technology, I’m now able to produce high-quality, highly aesthetic restorations in one appointment. Cerec allows me to fabricate inlays, onlays, full-coverage crowns, bridges, veneers, custom abutments and implant crowns. While the benefits of decreasing turnaround time are obvious and tangible, I didn’t account for the intangible benefits to the patient experience. There are no more gooey impressions, no more temporary crowns and, best of all, no second appointment. The look on a patient’s face alone when she realizes that she’s not going to have to clear another spot in her schedule has well been worth the investment. If you asked my postgraduate self which single innovation would directly impact my success as a dental professional in the future, I’m willing to bet that the word laser would not have been my first guess. In June 2015, I purchased an amazing isotropic CO2 laser, which vaporizes enamel while desensitizing the tooth, allowing me to prepare cavities without anesthetic. This is a game changer for children and patients with needle phobias. While it greatly reduces anxiety in patients who typically avoid treatment due to the injection, it also benefits children who tend to damage their soft tissues by biting their numb lips or tongue. Beyond my initial expectations, this technology has also allowed me to expand the services that I offer. Gingivectomies and frenectomies are now commonplace in my practice. Having the ability to work in multiple quadrants of the mouth in a single appointment has positioned my practice as innovative, efficient and a paragon of the patient experience. At the end of the day, every investment of time, staffing and technology must make dollars and sense—pun intended. The key part of this ROI equation that many professionals continually overlook is the intangible benefits. You can purchase a new scheduling tool and directly see its impact on appointments scheduled, but how can you measure the benefit a patient receives simply by having the option? On any given day, I may use my laser only a few times; many patients are comforted by the option being available, but also are just fine with local anesthetic. But I don’t consider the laser a wasted investment, because I’m equipping my patients with the knowledge of the range of tools available to them; patients feel comfort in knowing that if the needle is too much for them, we’ll be able to switch over to the laser without any sort of hassle or rescheduling. What this means from a “dollars and sense’” standpoint is that patients are now more comfortable with not only their dental health but also their dental health professional. This directly equates to a lifetime relationship with patients and, ultimately, a greater value for their care. Looking back on the first days of my practice, I feel absolutely blessed to be practicing dentistry in this day and age. Advancements in technology have allowed my staff and me to become effective, efficient and innovative practitioners. We can deliver efficient care with less pain without compromising on quality. And the best part? We’re delivering it to educated patients. When an investment turns a transaction with a patient into a relationship that will span a lifetime, it’s no longer just about the dollars—it’s about the trust, service and dedication between patients and their dentist. It’s a pleasure to work in an office that embraces technology to enhance the overall patient experience.